My son absolutely loves ducks. If I'm not mistaken, "duck" was probably his first word as a baby. He had his birthday this past week, and wanted a blue stuffed animal duck as his primary gift. 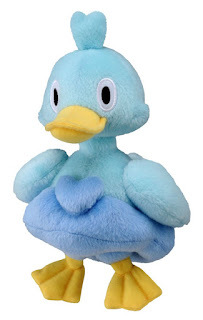 The only problem is, there are next to zero blue stuffed ducks in the marketplace. We searched for months, well before Christmas (it was his request then too), and finally found ONE. Not a single duck more, unless we looked into the rubber duck category. His grandma actually found this one pictured above and ordered it, and it came just in time for his birthday. It if would have been left up to me, he would not have received it in time, because I didn't think the odd thing around this ducky's abdomen would have been acceptable to him. But it suited him just fine, and he loves it. This morning, as I was preparing for a much awaited dentist appointment, I heard my boys playing with this duck. They were calling him "Lucky Duckie". (I realize I'm spelling ducky/duckie two different ways. I think "Duckie" as more of a personal name... evidence that yes, I'm neurotic sometimes.) It was fun to hear their squeaky little pretend voices, talking about Lucky Duckie as their friend who had a voice with his own desires and interests to share. The thought came to me that I should take Lucky Duckie with me to the dentist, so that when I would be stressed out in the chair, perhaps this stuffed animal would help me smile. I entertained the thought just enough to realize I needed to be more brave. But it would be my first visit to have this kind of procedure, so I figured I would keep on praying and hopefully the anxiety would leave me. I'd been nervous for weeks, and finally the day was here. It looks like someone wanted me to know that this appointment was lucky, after all. 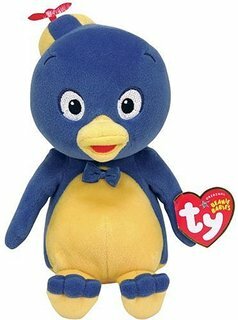 With a half numb face and tongue, I pointed it out to the dentist, how hard we had looked for a blue ducky for my son, and we all had some good laughs on the nature of toys these days. She said it belonged to another dentist, but since the hygienist pulled it off the shelf in the corner, I was able to find out that it is a Beany Baby toy. Never thought to search under that name for my son's toys! I don't know about you, but I'd say this was a pretty lucky moment. In fact, more than lucky, I'd call it a miracle, as evidence that Jesus was with me, as were angels, helping this dentist do safe, nearly pain free work. The entire time I was praying her hands would do perfect work, as though Christ were at the helm. He knows best what my mouth needs. If I'm not perfect in my faith, to heal my teeth without intervention from medical professionals, having Him guide her hands was the next best thing. I'll take the blue ducky as a sign that my impressions were true. He was indeed there, as I suspected. Thank you Jesus, thank you Father. What a gift to know I was not alone in this. Yes, I call it a sign and a miracle, thank you so much. I see you met Pueblo the Penguin from Backyardians. But he does pose well as a nice blue duck ;)Thanks for sharing this story. Ahh, that's right! :) I knew I recognized him! God is in everything, isn't He? He has been with me this week with some wake up calls, tiny shift adjustments (that still throw me out of whack), and some enlightenment.